JOAN DAVIS, ABBOTT & COSTELLO AND KATE SMITH ALL FELL - AND HARD - IN RATINGS FROM ONE SEASON TO THE NEXT. First Season Phenoms on this site identifies the biggest first year gainers of Network Radio’s Golden Age. But what about the greatest losers over the duration of one season? They included some big names, too, like Joan Davis, Abbott & Costello and Kate Smith pictured above. Following are those personalities and programs that dropped out - way out - of the Annual Top 50 in just the ten months of a season or less. In every case, these unfortunates broke one or more of the seven rules for ratings success cited by C.E. 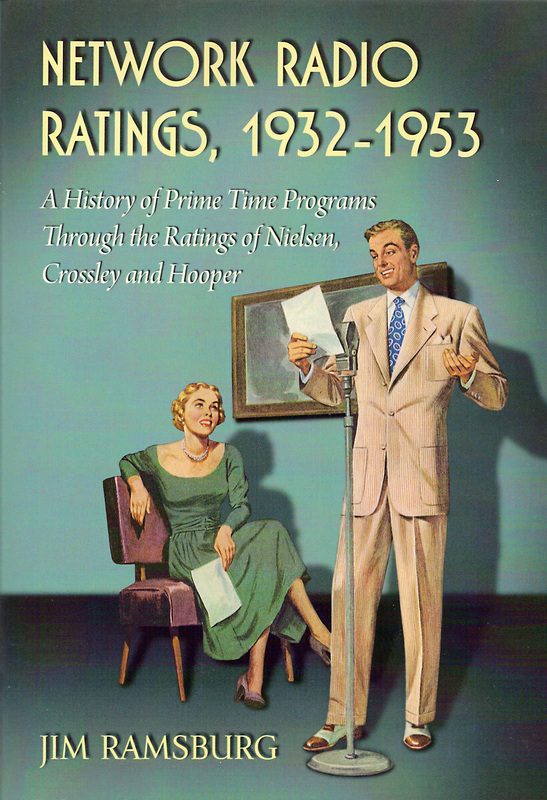 Hooper on page 21 of Network Radio Ratings, 1932-1953. And once again it comes down to the Three C’s identified in First Season Phenoms, namely, Program Content, Program Competition and Program Consistency in time, day and/or network of broadcast.. If you read First Season Phenoms, three of these names will look familiar. Comedians Joan Davis, Red Skelton and Fanny Brice appeared on that list, too. Joan Davis made a big splash with her first series, Sealtest Village Store, co-starring Jack Haley in 1943-44. The two comedians rang up a pair of Top Ten seasons in NBC’s cushy Thursday night timeslot at 9:30 sandwiched between Bing Crosby’s Kraft Music Hall and The Abbott & Costello Show. Davis left Village Store in 1945 when offered a “million dollar” contract by Lever Brothers, (those quotes are explained on page 144 of Network Radio Ratings, 1932-1953), and jumped to a prime slot on the CBS Monday schedule as lead-in to Lever’s Lux Radio Theater. Her Joanie’s Tea Room, featuring popular baritone Andy Russell, managed to remain a Top 20 attraction for two seasons but Lever didn’t consider it worth the big money and cancelled. Nevertheless, CBS didn’t give up on Davis - unless you call pitting the new Joan Davis Time against two established hit shows with loyal listeners “giving up“. Slotted at 9:00 on Saturdays in 1947-48 opposite Your Hit Parade on NBC and Gangbusters on ABC the comedienne lost over 60% of Joanie’s Tea Room’s ratings and never returned to the Annual Top 50. A Date With Judy was Network Radio’s most popular sitcom revolving around the misadventures of a teenaged girl. The show debuted in 1941 and for two years was the summer replacement for Bob Hope and then filled for Eddie Cantor’s summer hiatus in 1943. Louise Erickson took the lead role when Lewis-Howe’s Tums Antacid tablets slotted Judy on NBC’s hot Tuesday night schedule at 8:30 in 1943. After a rocky first season the sitcom moved into the Annual Top 50 in 1944-45 and continued to climb for the next four years in Tuesday’s comedic company of Bob Hope and Fibber McGee & Molly, plus the arrivals and departures of Amos & Andy, Red Skelton, People Are Funny and Hildegarde’s Raleigh Room. A Date With Judy was cruising along in 13th place at mid-season in the 1948-49 when the roof fell in. Tums cancelledthe show in January, 1949, and replaced it with The Alan Young Show, a sitcom with a feeble ratings record . True to form, Young lost over 40% of Judy’s audience and was cancelled six months later. Meanwhile, A Date With Judy was left without a sponsor and network home for ten months until ABC placed the show on its Thursday schedule at 8:30 under the dual sponsorship of Ford Motors and Revere Cameras. It didn’t have a chance against the night’s top rated Mr. Keen, Tracer of Lost Persons on CBS and NBC’s Father Knows Best. Milwaukee-born Loretta Sell, better known to audiences as The Incomparable Hildegarde was a woman of remarkable talents. With a bubbly personality she could ad-lib with ease and comfortably transition into songs of various languages at the drop of the handkerchief that she customarily waved. Primarily a nightclub entertainer, "Hildy" received her first Network Radio exposure in 1939 as singing hostess of 99 Men & A Girl, featuring the huge WPA Symphony Orchestra led by Raymond Paige. The show lasted for less than a season, but Hildegarde established herself as a solid network talent. Hildegarde returned to nightclub work for the next four years until she was tapped by Brown & Williamson Tobacco’s Raleigh Cigarettes to emcee Beat The Band, an audience participation quiz used as summer replacement for Red Skelton in 1943. The show worked and Raleigh gave it a full season run on NBC’s Wednesday schedule in 1943-44 where it ranked among the night’s Top Ten shows. When Skelton was drafted in the summer of 1944, Hildegarde was given his prime Tuesday night NBC timeslot following Bob Hope, the season’s Number One radio attraction. Although Hildegarde’s Raleigh Room, a radio version of the singer’s nightclub act of songs plus fun and games with the audience, lost almost 45% of Skelton’s ratings, it was one of 1944-45’s Top 15 shows. Skelton returned from the Army in 1945, and Hildegarde’s Raleigh Room was moved back to her former Beat The Band Wednesday night timeslot on NBC for a final Top 50 season before Brown & Williamson cancelled. Her show was picked up by Campbell Soups in 1946, renamed Hildegarde’s Campbell Room and moved to CBS on Sunday nights at 9:00 - a soft spot in the network’s schedule against ABC’s Walter Winchell and the long running Manhattan Merry Go Round on NBC. The Campbell show lost over half of Raleigh Room’s audience and was cancelled after six months. Hildegarde resumed her successful nightclub career and never returned to Network Radio. Those fans tuned in for Abbott & Costello’s first season of shows for R.J. Reynolds‘ Camel Cigarettes. Although the season, was shortened to six months by Costello’s bout with rheumatic fever, it barely missed the Annual Top Ten. The comedy variety show featuring a supporting cast led by character actors Mel Blanc, Frank Nelson and Verna Felton, did reach the Top Ten during its second season and enjoyed a total of five years of successful, albeit slowly eroding ratings. The comics never lost their time period to feeble CBS or ABC competition over that span Nevertheless, Camel cancelled at the end of the 1946-47 season. ABC came to their rescue and scheduled the team on its Wednesday schedule at 9:00, offering the show to sponsors on a participating basis and to its affiliates for co-op sponsorship. Suddenly, Abbott & Costello had something they’d never faced in their NBC days - real competition for the comedy audience. In this case it was from Duffy’s Tavern on NBC, a Top 15 show that doubled Abbott & Costello’s ratings in 1947-48 and pushed them out of the Top 100 permanently. Newscaster Lowell Thomas enjoyed a phenomenal prime time Network Radio career of 46 years from 1930 to 1976, remarkably all at the same broadcast time of 6:45 every Monday through Friday. During the first 15 years of the Golden Age, Thomas never dropped out of the Annual Top 50, achieving four Top 20 finishes with his straight, friendly delivery of the day’s news with a rich voice also known to millions as the voice of Fox Movietone newsreels. Thomas’ nightly newscasts sponsored by Sun Oil on the Blue network from 1932-33 through 1942-43 averaged an annual finish among the Top 25 ranked programs. When NBC confiscated Thomas and his sponsor in 1943-44 for the next four seasons, the newscaster’s average ranking sank to 37th - still a strong return. That’s why the 1947-48 season came as a shock. What happened? Thomas switched to CBS, that’s all. Yet his nightly news reports for Procter & Gamble lost over 25% of its NBC audience and for the first time in his Network Radio career, Thomas dropped out of double digit ratings and any night’s Top Ten list. In all fairness to the dean of nightly newscasters, Thomas‘ decline was part of a general trend that began at the end of World War II when listeners no longer felt the urgent need to keep up with daily dispatches from the battle fronts. . The March of Time benefited from NBC’s sweep of Thursday night’s Top Ten in 1943-44, with the powerful Abbott & Costello Show as its lead-in and little competition for its 10:30 time period. Originally a series recreating the week’s news events with actors portraying national and international newsmakers, the program shifted its format in during World War II to incorporate the reports of sponsor Time Magazine’s correspondents stationed in world capitals. One important element of the program didn’t change, however, and that was “The Voice of Time,” Westbrook Van Voorhis, whose powerful narrations were also heard in the frequent March of Time two-reel documentaries familiar to movie audiences. The march came to a crawl in the 1944-45 season when Time, Inc., purchased 12½% of the new American Broadcasting Co. and moved the show to ABC’s Thursday night schedule at its familiar time of 10:30. But now, it was fighting the powerful NBC lineup, slotted opposite Rudy Vallee who had just returned from military service to a hero’s welcome of double digit ratings. The March of Time lost 52% of its audience and left the air at the end of the season. Red Skelton is the only former Number One Network Radio attraction to make this dubious list. His fall resulted from a number of circumstances His 1950-51 Top Ten CBS Sunday night timeslot enjoyed a powerful 90 minute lead-in provided by Jack Benny, Amos & Andy and Edgar Bergen. Then, in a dispute with sponsor Procter & Gamble, his show was cancelled. CBS moved the comedian to its Wednesday schedule at 9:00 opposite Groucho Marx’s You Bet Your Life on NBC - a Top Ten show - and went looking for a new sponsor. But it wasn’t easy to find an advertiser willing to underwrite Skelton’s expensive show in a year when listeners were deserting Network Radio in droves to become television viewers. Because Skelton’s show was sustaining for most of the season, it went unrated. CBS finally landed Norge Appliances as Skelton’s sponsor in March, 1952, but his meager 3.9 rating was less than half of Groucho’s 8.6 average over the last four months of the season when they competed head to head for ratings. There are more reasons for Skelton’s forgettable season as detailed on page 199 of Network Radio Ratings, 1932-1953, headed Red Weds A Disaster. But his fans will be happy to know that the beloved clown returned to NBC and the Annual Top 50 the following season. Inner Sanctum akaInner Sanctum Mysteries was another victim of increased competition due to a network switch. Himan Brown’s well produced series debuted on Blue’s Sunday schedule at 8:30 in 1940 and faced an uphill battle against One Man’s Family on NBC for three long seasons Sponsor Colgate moved Inner Sanctum to Saturday nights on CBS in 1943, then on to Tuesday at 9:00 against NBC’s Molle Mystery Theater in 1944. The two programs split the mystery drama audience. Inner Sanctum failed to score double digit ratings and Colgate cancelled.. Lever Brothers bought the show for in 1945 and kept Inner Sanctum in the CBS Tuesday time period against its own Amos & Andy on NBC. But with Mystery Theater gone, Inner Sanctum finally cracked the Annual Top 50. Then in 1946, Lever Brothers and Emerson Drug’s Bromo Seltzer virtually traded programs. Emerson bought Inner Sanctum and moved it to Vox Pop’s CBS Monday timeslot at 8:00 while Lever picked up Vox Pop for Inner Sanctum’s vacated CBS timeslot on Tuesday. Inner Sanctum responded to the switch with four hit seasons - two among the Annual Top 25 programs and another two in the Top 20. As detailed in The Real Mystery Is Why on page 196 of Network Radio Ratings, 1932-1953, Emerson pulled the rug on Inner Sanctum and cancelled the Top 20 show in April, 1950, replacing it with Hollywood Star Playhouse, a mystery anthology series featuring movie stars. Mars Candies bought Inner Sanctum for 1950-51 and moved it to ABC’s schedule on Monday at 8:00 - opposite Emerson’s Hollywood Star Playhouse on CBS It was the 1943 situation all over again, with two mystery anthologies opposite each other and once again Inner Sanctum came up short, losing over 65% of its audience. Fanny Brice had registered seven consecutive hit seasons in 1944 - four Top Ten seasons and three that just missed - while teamed with Frank Morgan on NBC’s Thursday schedule. The pair first starred in Good News and then Maxwell House Coffee Time, both sponsored by General Foods. The 53 year old comedienne’s skits as Baby Snooks made her character Network Radio’s most popular “child” star behind Edgar Bergen’s Charlie McCarthy. Then General Foods got the bright idea of splitting their team - keeping Morgan in the Thursday NBC show and starring Brice in a new entry, Toasties Time, slotted for CBS in the 1944-45 season on Sunday at 6:30 opposite The Great Gildersleeve on NBC and ABC’s star-studded Radio Hall of Fame. Why was such a move made? For the same reason that General Foods also uprooted Kate Smith from her successful Friday night variety hour on CBS - the network’s leading program on Friday for four consecutive seasons - and shifted her to CBS’s Sunday schedule, following Brice, at 7:00, and directly opposite NBC’s Jack Benny. The idea behind the maneuver was to take down Benny, General Foods’ radio star of ten years who had sold his show to American Tobacco’s Lucky Strike Cigarettes. The entire story is told on page 133 of Network Radio Ratings, 1932-1953, in a section titled, Vengeance, Thy Name Is Jello! So how well did it work? To put it mildly, it was a disaster for both of General Foods’ top female stars. Fanny Brice lost 52% of her Thursday night Hooperating in the attempt to weaken Benny’s lead-in, The Great Gildersleeve. Kate Smith, slotted directly against Benny’s Top Ten show, lost 40% of her Friday audience. Meanwhile, Benny and Gildersleeve each lost only 14% of their previous season’s ratings in the assault and both went on to even greater success. After the Sunday night fiasco of 1944-45, Fanny Brice scrambled back into the Top 50 for her remaining five seasons in Network Radio. But Kate Smith struggled along beneath the Top 50 for two more seasons until her show was cancelled and she left CBS after 15 years. She didn’t recover her former popularity until she entered television in 1950 - on NBC-TV..
Vox Pop, Network Radio’s popular human interest interview show, had produced five consecutive Top 50 seasons for Emerson Drug’s Bromo Seltzer in Monday’s CBS lineup at 8:00 against NBC’s prestigious but low rated Telephone Hour and Cavalcade of America. Hosted by personable Parks Johnson and Warren Hull, Vox Pop the 1945-46 season with its highest ranking and second highest rating in its history - part of a solid CBS lineup that included Bob Hawk, Joan Davis, Lux Radio Theater and Screen Guild Players, a combination that won every time period from 7:30 to 10:30. Then Emerson and Lever Brothers swapped programs - Vox Pop for Inner Sanctum - and Vox Pop was moved for the 1946-47 season to Tuesday at 9:00 on the CBS schedule. Like Inner Sanctum the season before, Vox Pop found itself pitted against another Lever Brothers show on NBC - the resurgent Amos & Andy sitcom which was headed for a Top Ten ranking. The results were predictable. Vox Pop lost nearly 40% of its audience and never returned to a season’s Top 50. The Bottom Line: What caused these seasons of rapid decline? They all have one striking similarity - all of these programs changed their day, their time or their network and faced greater competition than in their earlier, successful seasons. It’s a situation that’s repeated over and over again in Network Radio Ratings, 1932-1953 , and almost invariably the result of decisions by sponsors, agencies or networks - seldom the talented people whose ratings and reputations were on the line every week.